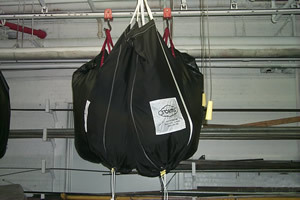 We are the largest manufacturer of laundry slings in the United States. Our experience, service, and product selections make us by far one of the leading players in the industry. Our slings are designed with the objective of enhancing the productivity of our customers' operations. We work closely with them and frequently provide them advice on how to optimize their complete laundry cycle, from start to finish. Rather than taking a "one size fits all" approach, we are proud to offer sling products that are tailored to meet our customer operations. We provide individual advice to our customers in key industry practices such as loading and unloading, weight capacity, fabric selection, and proper sizing. Please let us know about your sling product needs and we will be happy to help. You can either fill out our Online Service Form, or Contact Us at using one of our multiple channels.